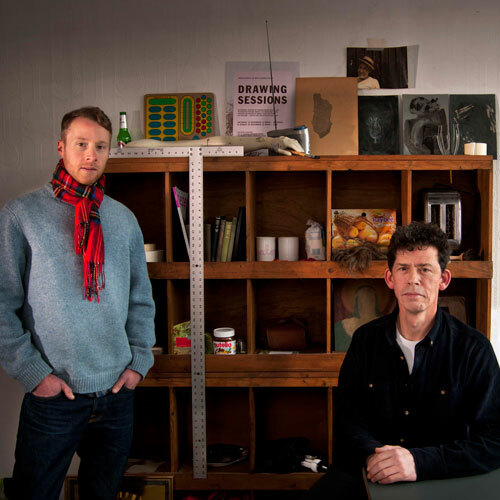 Members of the Royal Standard studio, Jon Barraclough and Mike Carney curate, design and publish The Drawing Paper, a not-for-profit, independently published, newspaper-based gallery focussed on contemporary drawing practice. It is distributed freely around selected galleries and establishments in Liverpool, the UK and beyond. They have published four issues since 2010 and continue to provide a platform for local, Liverpool based artists, exposing their work to a much wider audience, as well as linking other artists up with one another. Drawing Paper is an independent newspaper based gallery of sorts and platform for drawing in all its forms. 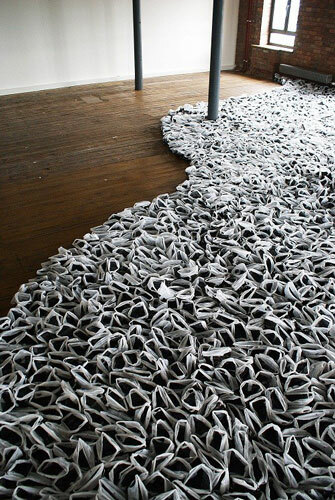 We showcase work from emerging, established, local and international artists. It’s a not for profit project and logo free zone, funded and made possible by fees collected from its contributing artists (which pays for printing and some distribution). My drawings are somewhat minimal, intricate and restrained abstract explorations. Working with fine line ink pens, pencils and dry transfer shapes and textures, I have devised a visual vocabulary of controlled geometric elements alongside loose, expressive gestures. I enjoy the compositional challenge trying to marry these differing elements together. I like the contrast between the controlled, precise details and the expressive marks. This interest stems from my work as a designer where I’m frequently working with software which allows for absolute control and precision. When I’m drawing there’s no undo button so I have to embrace the mistakes and accidents. Sometimes I have a visual starting point in my head, other times I allow drawings to evolve more intuitively. Possibly in an unconscious attempt to emulate the computer screen I tend work on bright smooth or glossy paper. Having not really drawn much since my school days and foundation course almost 20 years ago, my interest was sparked again by Drawing Paper partner Jon Barraclough about 10 years ago after a particularly fine homEmade Thai curry at his house one winters eve. I began developing my practice more seriously when I joined The Royal Standard in 2007. 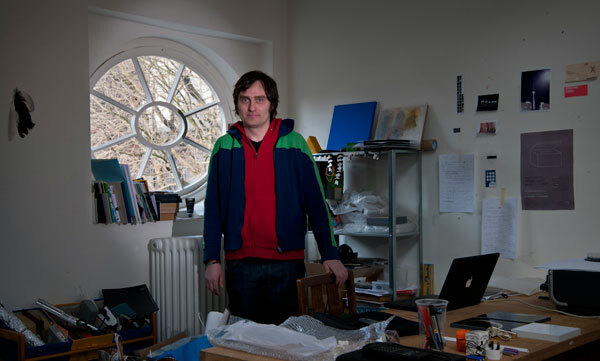 I was born in Warrington but my parents moved back to Liverpool when I was 2 years old and I’ve been here ever since apart from a couple of years studying Graphic Design up the road in Blackpool during the early 90s. My creative friends, music, books, collections of things, curious objects, overheard conversations, trawling the internet, the countryside… inspiration can come from almost anything. Cliched, but there’s always something interesting going on. Designing my own book showcasing my drawings and having a generous budget to work with. Perhaps the local art establishments could pay a little more attention to talented locals by making purchases and offering opportunities to exhibit in addition to their outward looking programmes and agendas. There needs to be more contemporary and critically engaging independent spaces and pop up projects and we need to retain our creative people. Liverpool is traditionally a transient city with people coming and going all the time but I would like to see more people staying and establishing things as they develop more skills and gain confidence. The Biennial, Cy Twombly at Tate Liverpool and The John Moores Painting Prize at The Walker. All the shows at The Royal Standard of course. I know this chap called Bantam Lions who makes electronic music. You should check him out. I’m a 54 year old emerging artist, father of three great sons who are growing up, at last, and giving me (some) time to do my thing. I’ve been an engineer, worked in a shop and, after art school, made a living either as a teacher or a graphic designer. Around fifty I began to think I had something to say as an artist. Q. Can you tell us a little more about the ethos or thinking behind your work? Drawing Paper was mostly Mike’s idea – but I was very happy to join him and to get behind it. We both love the printed object and we both love drawing . Our appreciation of the power and magic of drawing, in the broadest sense, and our experience of being visual communicators gives us a shared sense of excitement about drawing – and we are moved by very similar kinds of work. Drawing Paper is therefore a coming together of our shared obsession and it retains an independent, lo-fi feel that people like. If someone else was doing Drawing Paper I’d collect it and want to be in it. Q. How/when did you start making art? When my dad taught me how to draw from imagination. I would watch him with fascination as he created something out of nothing on a scrap of paper. I’d be about 5 or 6. Then I had a painting of a cityscape chosen to be in the Bradford School’s Junior Art exhibition in 1966, at the Cartwright Memorial Hall. I’d seen work there by Henry Moore and Hockney and figured I was on the way to fame and fortune. I’m an estranged Yorkshireman. I came to Liverpool from London, where I had my first studio, because I wanted more time and space and because I was offered some teaching at the Poly. It was a definite choice to come to Liverpool though. I knew I had to get back up North, to reality. Everything and nothing. Or maybe the connectedness of all things and the traces we leave behind us. Q. What do you find inspirational about Liverpool? It’s pride, it’s scale and it’s faded grandeur. There’s a romantic and edgy feel about it too. Q. What would your dream project be? To open a drawing centre in Liverpool. To write a sensible, useful, and helpful book about drawing. Q. Do you think there is enough support for emerging artists? Q. What do you like/what would you change about the Liverpool art scene? A greater sense of collective passion, ownership and sharing between institutions and artists – and the audiences they reach. Q. What can we expect from the work you’ll show at the Liverpool Art Prize exhibition? Q. What other exhibitions/shows/events are you looking forward to in 2012? 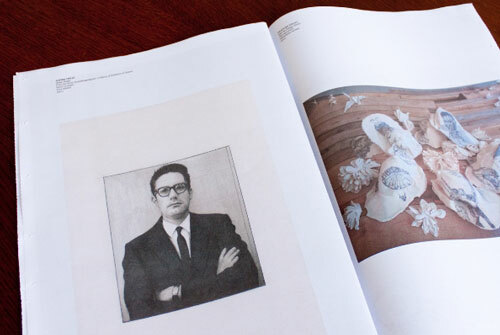 The Liverpool Biennial, Cy Twombly and David Hockney at the RA. Oh and the show I’ll being putting on at the Victoria Gallery and Museum in June with artists from New York and Louisiana. Drawing Paper number 15? Happy in my work? Robyn Woolston’s practice involves installation, photography, moving image, print and on-line projects. She is passionate about people, relationships and the way the world works. 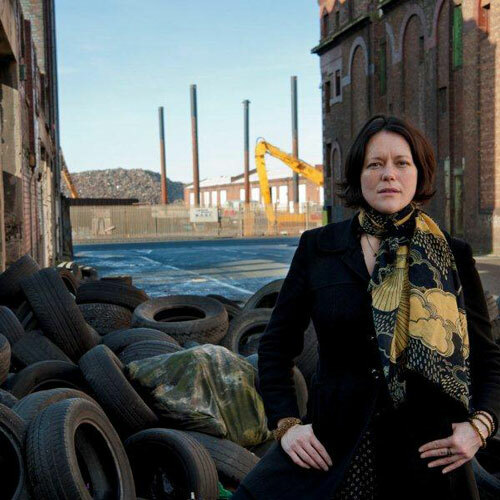 This is reflected in her work, which raises questions concerning social, economic and ecological perspectives. -I am an artist and filmmaker. I began my career working in broadcast television but soon sought a platform that offered me greater freedom and ‘space’ to create. After being commissioned to Produce and Direct a short documentary for ITV called ‘Émigré’ I decided to study Fine Art full-time. These days I install large-scale sculptural interventions created out of ‘waste’. As well as working with lens-based media in terms of Artists Film and Video / Photography. I also work with everyone from primary school children through to prisoners, as well as vulnerable and hard to reach adults, across a myriad of Art in Education settings. -I play with the symbols and products that a culture uses to create its meanings. My sculptural interventions comment on the co-dependent relationship between consumption and power, identity and autonomy, and the documentation and harvesting of processes within the socio-psycho geography of our collective experience. -For example, we are fundamentally disconnected from the ‘waste’ that is generated by the commercialised systems that service, and profit from, our basic needs. I’m talking specifically here about the large-scale waste that is, in turn, creating large scale impacts upon the planet and our quality of life. Many corporate processes are fundamentally, and structurally, orientated to benefit their shareholders rather than the larger community. Thereby putting profit before people. – My earliest memories involve being immersed in ‘making’ whether that was drawing, painting, pasting or sticking; as well as long summer nights exploring the world on my bike until the sun-set. So, really, I don’t remember a day when art and nature weren’t a fundamental part of the way in which I ‘process’ life. They are both a window and a mirror. -I took my Fine Art degree with Wirral Met College through John Moores University and stayed for the Capital of Culture in 2008. The possibilities really started opening up in terms of the city and its creative networks and in many ways it’s continued to flourish despite the fact we’ve lost some key players. – Systems, processes, patterns, cultural idiosyncrasies and perpetuated memes. Plus ‘waste’ products from the socio-political to the literal. – I’d love to work with harvested plastic waste from the North Pacific Gyre. It’s the world’s largest eco-system yet the waste contained within it covers an area larger than Texas. It’s so far out to sea that it seems there’s a complete ‘disconnect’ in terms of personal responsibility on the part of the polluters. The responsibility lies with both on-shore and off-shore processes and for me the waste is representative of non-circular thinking. Within holistic paradigms every part of the process is a part of the people that create, make, use and utilise its reason-for-being, it’s circular. There is no disconnection as the waste is as important as the product or service that generates it. -It can be incredibly hard to sustain yourself whether you’re emerging or mid-career as there are very few financial ‘guarantees’ along the way. But what is abundant are opportunities in terms of locations, material and peer-to-peer support. Nationally there are some great bodies ‘defending’ and re-defining the boundaries of Contemporary Arts practice and I would encourage new artists to become members of both AN and Axis. Q: What do you like about the Liverpool art scene? – I love the density and variation of work on show during the Biennial & at the same time I admire ‘emergent’ galleries such as Curve. They actively seek to promote professional practice at an emerging level, and by doing so are re-defining the power structures of the city in a ‘rhizomatic’ fashion. I also adore Liverpool’s architecture, with all the innate possibilities it offers, there’s space to create, intervene and exhibit in conjunction with people like Camp and Furnace at the former A Foundation. The fabric of the city calls for sculptural interventions that reference migration, trade and industry against an ever changing sky-line. -It’s my most ambitious work in terms of the opportunities and constraints presented by the space. I’m working with the Accumulator Tower so I’m dealing with shifting, and at times ephemeral, light. Plus the height of approximately eleven metres is offering up some exciting engineering conundrums. – Hopefully continuing to ‘broker’ relationships between materials, locations and people. – I once ran the London marathon and a few years later fasted for three days, on my own, in the middle of the Sinai desert with just 16 bottles of water and a sleeping bag….so probably, resilience. 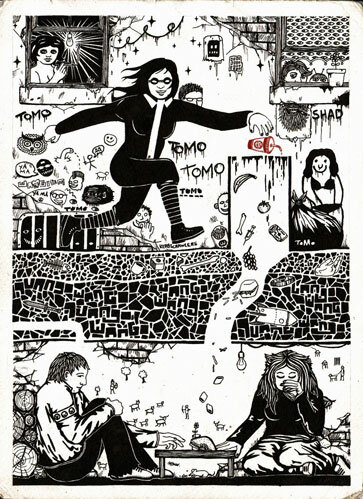 Tomo’s work can be seen as a kind of storytelling through the materials he uses. The work is informed by a strong DIY ethic and he strives to make the best he can with whatever is available, often working with discarded items. My name is Tomo, I grew up mostly in sleepy suburban Liverpool in a neighbourhood known as ‘Two Dog’s Fighting’, my Pop’s is a Joiner and my Mum a Social Worker which is probably why I’m alright with my hands and sometimes with people. I like being still and also being on the move but I normally find myself alternating between these states. Q:Can you tell us a little more about the ethos or thinking behind your work? There’s a few different things going on but mainly I like to think about my process as a kind of alchemy, especially when I’m working with reclaimed or discarded materials. Sometimes I even think of it as akin to music sampling, taking things from different era’s and areas, mixing, chopping and changing. Although there’s a bit of me in there of course, the human element is probably what makes it interesting. I always made art since as long as I can remember. As a kid I was always drawing and my family encouraged me. When I was a teenager I discovered graffiti but I kept that one more to myself, like you do. I’d still watch Watercolour Challenge but I liked the adrenalin aspect of graffiti. Later on I went through the education system and studied graphic design which was great but then I fell in with the wrong crowd and soon enough I ended up making more personal work. I grew up here, although often I venture afar, even when my finances require me to improvise. Last time I was brought to Liverpool I think it was via a car. Everywhere really, I find a lot of ideas in normal everyday life, in the so called mundane, if you look beneath the surface there’s all kinds of jewels and gems waiting to be discovered..
There’s a good diverse mix of people here, a lot of movement and you can feel that over time different forces have shaped the city. There’s always something to do here if you want but there’s still enough quiet to be found which I think is very important. Compared to some of the bigger cities one can end up in the pace here is quite slow and this suits me well as I have quite a slow pace myself. Also it hasn’t reached a point where any place feels culturally over-saturated; you can see gaps and missing pieces and then find a way of infusing them with your own energy. The negative space is equally as important as the positive space. I love exploring all those neglected sites and derelict buildings too, here one can find a wild untamed energy and maybe a little glimpse of freedom. Anything where my work can have a positive effect on people or help them see things differently. I like it when there’s a chance to get through to people who would not normally take an interest in art. That’s one of the reasons why I occasionally work outside in the street. This Liverpool Art Prize thing is a kind of dream project too. Not because of the prize element but because I’m considered worthy to share the shortlist with a very talented group of creatives, all of whom more experienced than myself. Recently I heard that the folk at Metal routinely walk around the train platform and invite commuters into the gallery, this got me rather excited. I’m talking reality though aren’t I? A ‘dream’ project would be me stumbling through the darkness of a strange far away city installing artwork on government buildings. Just when I’m about to get caught a limousine getaway vehicle picks me up and the driver informs the police that it can’t be me, because I’m now wearing a designer suit and am being escorted to an expensive restaurant to meet a lady-friend. The next day I fly into another country where a man meets me at the airport with my name on a card. We travel by horse to a secret location, some great art gets made, then there’s a party in my hotel room, everyone is invited and we smash it up like rock stars and the telly gets thrown out the window. Depends what you mean by support? I work with a sort of D.I.Y. ethic and the kind of support I’ve been fortunate enough to receive is that from likeminded individuals in similar positions to myself. If you can get even a small bunch of people together and share skills you can develop something much more powerful and wholesome than if you were just given a cheque. I think Liverpool is great for its creative support networks and a lot of the time things grow from the bottom upward very successfully. Wolstenholme Creative Space I hear is planning some exciting stuff for Liverpool Art Month, a little bird tells me. I also heard that Liverpool’s Hip Hop scene will be starting to wake up again after a long rest. Most interestingly though, last year a man in a pub told me that this year on the 15th of March at precisely 3.30am – everybody’s level of consciousness will suddenly become elevated, no effort required! If it really happens that would be nice. I never really think that much ahead, I could be dead or in jail, or even living the dream. They wouldn’t be quite so hidden if I told you. 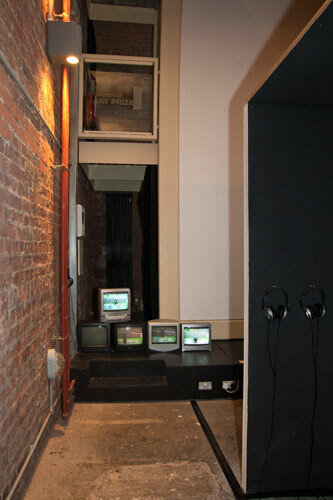 Nominations for the 2012 Liverpool Art Prize open on Monday 5 September 2011 and close on Friday 25 November 2011. 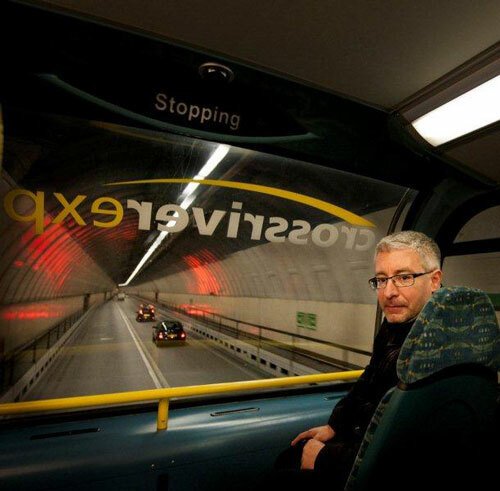 2012 will be the 5th Liverpool Art Prize. 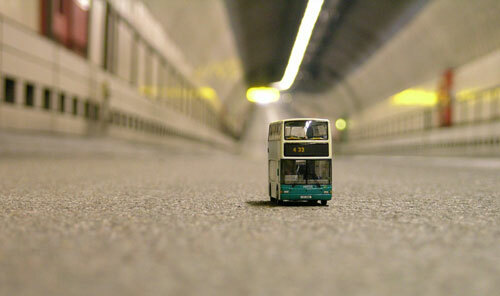 The exhibition of 4 shortlisted artists will take place at Metal at Edge Hill Station. You can nominate up to three artists. The artist needs to have exhibited or realised a project or piece of work in the previous year (June 2010- Present) and there needs to be evidence of this online in order to complete your nomination. Artists who have been shortlisted for the prize in the previous two years are not legible for the prize. 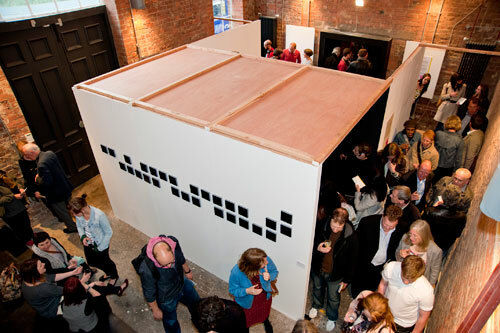 Artists will need to be available to exhibit as part of the Liverpool Art Prize 2012 (26th April – 9th June). Nominated artists need to have made a demonstrable contribution or impact on the Liverpool art scene and to have developed a unique and individual art practice. Nominations are accepted from all artistic disciplines. from engraved plaques to large fascia signage, whatever your requirements, we will endeavour to help with our large product range. Maintenance – maintenance contracts for illuminated and non illuminated signage including cleaning and general upkeep undertaken. With a pop-up, fold-down, drive-through ethos, Camp and Furnace is a new kind of venue in the heart of the Baltic Triangle. Events space, bar/eatery, photographic studio, nightclub and caravan park hotel, our programme of events include art installations, exhibitions and performances; theatre, cabaret, comedy and music; street food markets, dinners and food slams. And that’s just for starters. We’re very happy to be involved with this year’s Liverpool Art Prize and we look forward to continuing our support and promotion of the city’s cultural offer. Established since 1820, Beesley & Fildes are an Independent Builders Merchant, with an emphasis on providing a broad product range, value for money, a first class customer care service and professional advice to trade professionals, self builders and retail. We would welcome the opportunity to compete for your valued custom and our sales staff are waiting for your call to discuss any requirements you may have. Our depots carry a comprehensive stock of Building & Timber Materials and we can provide everything you need for your next building project, no job is too small for us to quote competitive prices. Nothing is more important to us than a satisfied customer, providing the best service is our top priority. A large fleet of delivery vehicles and a broad range of stock enable us to have a quick turnaround from order to delivery and we offer a daily service throughout the North West on stocked products. For a stress free, comprehensive service, try Beesley & Fildes for your forthcoming project. 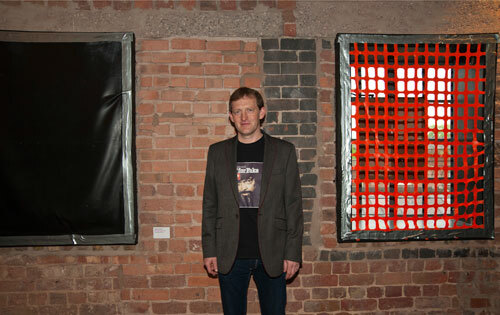 At a packed special Awards Ceremony at METAL on Wednesday 1 June 2011, Markus Soukup was presented with the prize of £2000 as winner of the Liverpool Art Prize 2011. Also, after counting the votes cast by visitors to the gallery it was announced that Brendan Lyons was the winner of the £1000 ‘People’s Choice’ prize. Markus will also have the opportunity to show at the Walker Art Gallery within the next year. Liverpool Art Prize 2011 at Metal, Edge Hill Station. 6 May – 11 June. Everything exhibited by Brendan is made out of paint alone. If you were to cut a cross-section between any two points of any one painting, it would reveal only paint. The paintings are then fixed to the wall using further paint as an adhesive. This leaves just one element (paint) attached to the wall. Through experimentation with the techniques of painting, and the material of artists’ paint itself, Brendan Lyons plays with our traditional acceptance of what makes an artwork. Art historically painting has always been the most dominant medium for artists, Brendan plays with this obsession by referencing this tradition and its formal elements (such as windows, patterns, grids, rectangles, layers) to investigate how we encounter and perceive the contemporary world. The paintings replicate what we would normally see in the urban environment, and are often placed directly into this environment. It is important that they sit convincingly within the contemporary built environment as well as within the gallery; highlighting the duality and the formal boundaries of these spaces. What may appear to be bricks, polythene sheets, staples, various types of tape, floor tiles, builder’s orange safety netting, tarpaulin, sheets of corrugated metal or cardboard, and other urban detritus – are in fact just unsupported paint alone. Here Brendan has created a site specific installation of his paintings responding to the architectural elements of the space, such as the walkways, windows and safety glass. The paintings appear to be the remnants of construction or temporary repairs. Look more closely and you will see that every element of the interventions within the space is made from paint alone. Underpinning and driving Bernadette’s work is a rigorous investigation of spatial relationships within the context of the empty page or blank canvas. Taking line as her starting point Bernadette constructs highly individual paintings, drawings and installations reflecting her ongoing fascination with the spaces we construct both real and imagined and our relationship to these spaces. The work seeks to present multiple view points, to suggest infinite possibilities, while drawing attention to the fragility of our constructs: the impermanence of things. The constructed spaces in the painting are intended to operate on a sensory level, conscious of the observer and the way in which seeing is interchangeable with revelation, or in what Stephan Mallarme described as a “sensory mode of apprehension”. 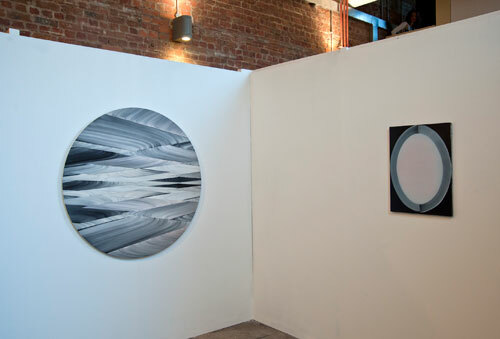 The more recent circular paintings suggest unpopulated landscapes where planes collide and distort giving rise to complex and unstable readings. Richard Proffitt’s work is inspired by and references spaghetti westerns, ghost towns, American sub-culture, anthropology, ancient civilizations, travellers, den making, folklore and urban myth. These inspirations become intertwined and their meaning mangled, producing work that is absurd, funny, dark and mysterious. The work will often become realised as make-shift ceremonial relics or ritualistic hang-outs. 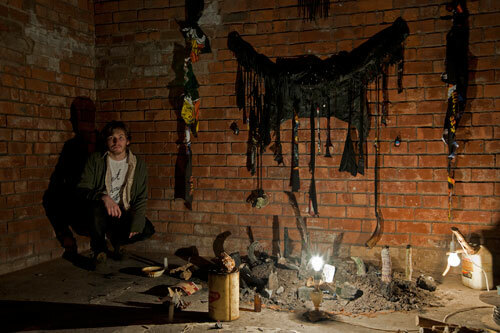 For the Liverpool Art Prize exhibition Richard has transformed Edge Hill’s Accumulator Tower into an abandoned shrine that pays homage to phantom obsessions with 50s rock ‘n’ roll, motorcycles and teenage tragedy songs. In part it is inspired by the Santeria religion found in Cuba which focuses on building relationships between humans and Orisha, powerful mortal spirits, through rituals and animal sacrifices. Their shrines are often found in abandoned back streets in Cuba and are a strange jumble of found objects, religious iconography, junk and other ephemera. Richard’s installations could be seen as a collection of fragments from a forgotten culture in a post apocalyptic age, a museum exhibit from the future, formed from the traces of disregarded items and forgotten crazes from our dominant Western culture. The objects within the installation become removed from their history, origin and belief system and merge together to form a new folklore or a new imaginary anthropology. For the Liverpool Art Prize exhibition Markus has produced new work that deals with the construction and deconstruction of film, language and motion. Through this work he is exploring how one element or its position can influence the whole, and vice versa. His animation ‘The Masque’ uses words rather than pictures to make us imagine the action suggested on screen. It makes us see the abstract nature of words, their form and shape and how they relate to one another. Markus wants us to engage in the art of looking, seeing the screen as something which can reflect our experience of reality. ‘Relicts’, a series of minimal typographical prints, raises questions about being positioned within the context of technology, society and nature, and the transitional relationships between these things. In ‘Chair Chair Sit In between’ Markus himself performs, referencing slap-stick and early movie pioneers, yet playing with the language of film and its boundaries, deconstructing the elements to a basic action and reaction in sound and vision.